Concordia graduate John Paul discovered a passion for pancakes and never looked back. His entrepreneurial business, JP’s Pancake Company, combines several ingredients to create an exceptional breakfast experience. Whether it’s the seasoning, the pancake mix, or JP’s vibrant personality, breakfast lovers have given JP’s Pancake Co. stellar reviews. The versatility of the company has gotten them invited to multiple weddings, birthdays, music festivals, retreats, grand openings, and more. He hopes to expand his business across the state of Texas, sharing his food, soul music, and lively personality with all. His vision began in the back of a Taco Cabana Restaurant with some leftover pancake mix. Upon watching the movie CHEF, JP was inspired to start a business. 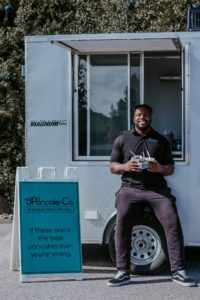 The unique-style breakfast truck has coined the term “Instagram food.” With a wide array of colors and toppings, consumers are posting pictures of their pancakes and John Paul says it is a “hugely successful marketing benefit” that has contributed to the success of the company. What else do foodies enjoy about JP’s Pancake Company? It’s simple, tasty, and above all, filling. As JP says “If the food isn’t any good, it means nothing.” I think his customers can agree that there is definitely something cooking, and it tastes delicious.